Imagine you are a manager and a team member comes to you one day and says, “I have got this great idea!” There are multiple ways you may respond to this situation. You may say, “Tell me more…” and after listening to his initial blurb you may ask, “Why this approach?” or if you have a better idea, you may ask, “How about this instead?” Depending upon the context all three responses may be relevant. However, Prof. Edgar Schein shows in his new book “Humble inquiry: The gentle art of asking instead of telling” that the three inquiries, in fact, belong to three distinct categories of inquiries. Schein argues that managers today need to do a lot more of “Tell me more…” type of inquiry than “How about this instead?” type of inquiry if they want to build trusting relationships. Before we understand why Schein says this, let’s first see what the three types of inquiries are. Humble inquiry: What is a humble inquiry? According to Schein, a humble inquiry has 3 characteristics (1) It demonstrates genuine curiosity (2) It makes least number of assumptions about the idea and (3) it is followed by attentive listening. Apart from “Tell me more…”, other examples of a humble inquiry are: “So…” (with an expectation look), “What’s happening?”, “What’s going on?”, “What brings you here?”, “Go on…”, “Can you give me an example?” Asking the right question is not the most difficult part of humble inquiry. Attentive listening is. If you try to fake the question, it will show up when you listen. Why? Because it is not easy to keep your preconceived notions aside and listen to what the other person has to say. Let’s contrast humble inquiry with two other categories of inquiries. Diagnostic inquiry: The second question the manager asked in the first paragraph, “Why this approach?” belongs to diagnostic inquiry. It is a type of inquiry where you steer the conversation in a specific direction by inquiring about feelings, reactions, causes, motives, next steps, previous steps etc. Through diagnostic inquiry you are influencing the mental process of the other person in an unknown way. Examples of diagnostic inquiry are: “How do you feel about that?”, “Why did you feel that way?”, “What may have caused this?”, “What have you tried so far?”, “What are you going to do next?” In this type of query, you take charge of the process but not the content. Confrontational inquiry: The essence of confrontational inquiry is that you insert your own ideas in the question you ask. The third question in the first paragraph, “Why not this instead?” belongs to this category. Essentially the question has your agenda embedded in it – either knowingly or unknowingly. Examples of confrontational inquiries are: “Did that not make you angry?”, “Do you think customer will it like it this way?”, “Have you thought of …?”, “Were the others surprised?” In this type of query, you take charge of the process and the content. It is the hardest type of query to build trusting relationship. Now, let’s come back to the question as to why Schein advocates humble inquiry. Well, whether you are a lead surgeon in an operation theatre or a delivery manager in a technology company or a CEO of an organization, you depend significantly on your team members (nurses, engineers, employees etc.) It is no longer sufficient to get things done by being “task oriented” – you do your job and I do mine and we will be fine. It is important to form trusting relationships to achieve results. Relationships are the key to good communication and good communication is the key to successful task accomplishment. Hence, Schein emphasizes “ask and listen” to “do and tell”. How can we use this while responding to a team member’s idea? Let’s borrow three-hats approach analogy of David Packard. 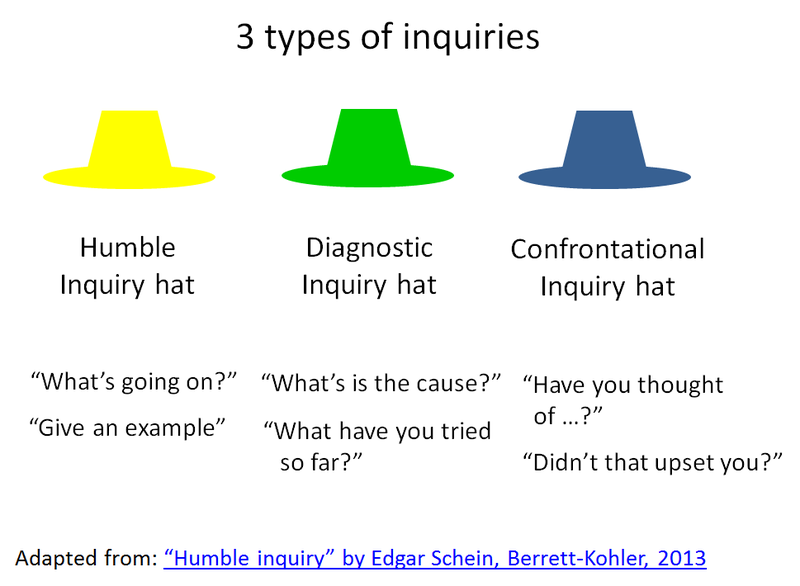 First, wear the “Humble inquiry” hat and ask clarification/example type of questions. Then wear the “Diagnostic inquiry” hat and see how he has arrived at this idea, what has he tried etc. And finally, wear the “Confrontational inquiry” hat before making the final decision. Simple , relevant , very interesting , yet , rarely practiced in the corporate world that I had seen ! Thanks for your encouragement LRN.